1994 Dictyophyllum irregularis GIVULESCU and POPA, p. 42-46, Text-figs. 1-3. Pinnae with a short basal web of lamina. Pinnae lobes are irregular, with acute apices, and rounded sinuses between lobes. The venation is also irregular. Typical features of D. irregularis include the irregular nature of lobes and venation. Anina, Resita Basin, mainly within the northern coalfields, such as Pit 1, sectors Zona Noua and Bradet. Hettangian in age, above the Coal Seam no. 2, usually confined to its roof. Marsh edges and flood plains. Preservation of the material is good, but the material lacks cuticles or in situ spores. Givulescu, R. and Popa, M.E., 1994. Eine neue Dictyophyllum - Art aus dem unteren Lias von Anina (Rumanien). Documenta Naturae, 84: 42-46. 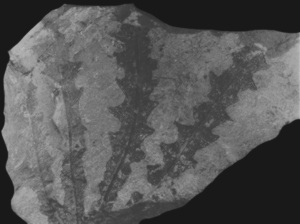 Dictyophyllum irregularis, holotype, sample 2515, Popa collection, University of Bucharest, roof of Coal Seam no. 2, Anina North, Pit 1.